NewsHome > News > How to buy suitable Iron ore jaw crusher in crushing plant? Jaw crusher features of convenient operation and stable performance in iron ore crushing plant, How to buy suitable Iron ore jaw crusher in crushing plant? Firstly we should make clear about jaw crusher technical characteristic such as low production cost, deep crushing chamber , wide adjustable opening size and uniform finished products.Iron ore jaw crusher can also be used for crushing middle and high hardness rocks such as granite, basalt,bauxite, pebble, marble, quartz sand and bentonite etc. Iron ore jaw crusher crushing capacity can from 20 tons per hour to 800tons per hour,The compressive strength is less than 320 Mpa . Great Wall series jaw crushers mainly refer to PE jaw crusher, PEC diesel jaw crusher and JC jaw crusher.The input size range from 100 mm to 1020 mm, jaw crusher also has little noise and no environmental pollution. Iron ore jaw crusher are extensively applied in fields of mineral, metallurgy, construction and highway. If you have questions on jaw crusher models and jaw crusher prices, please feel free to contact us. 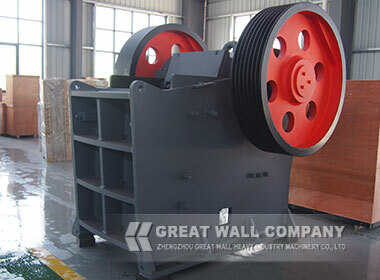 Previous: What are jaw crusher prospect in Quarry crushing plant? Next: Why choose Jaw crusher as primary stone crusher in crushing plant ?